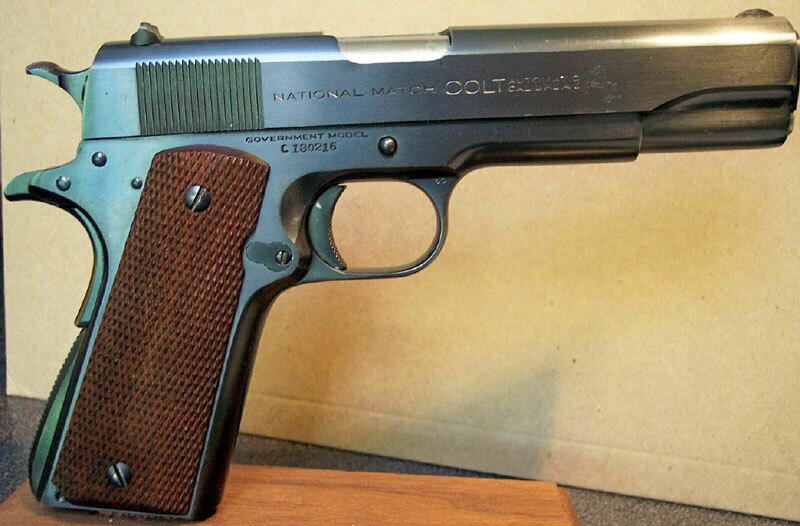 Colt National Match Serial Number C180216 with fixed Patridge sights, blued finish and checkered walnut grips. 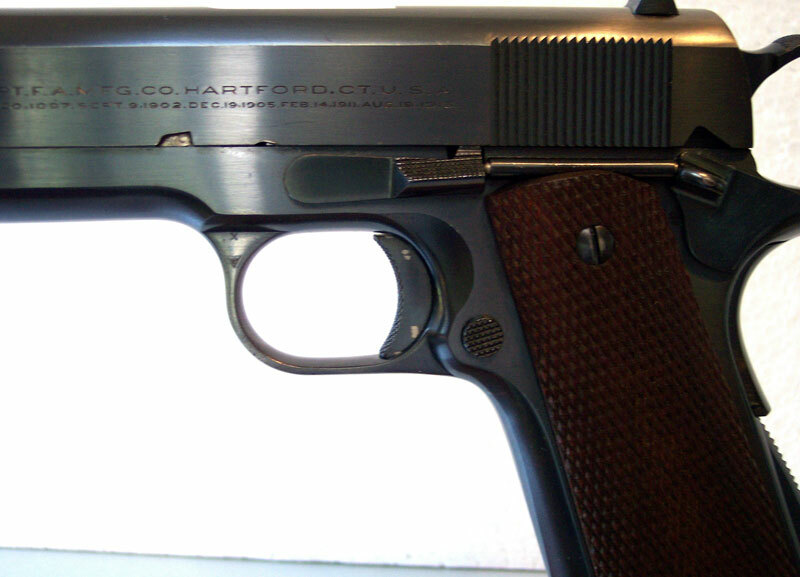 Serial number C180216 was a one gun shipment to the Post Exchange, U.S. Army, Fort Jay, New York, March 9, 1936. 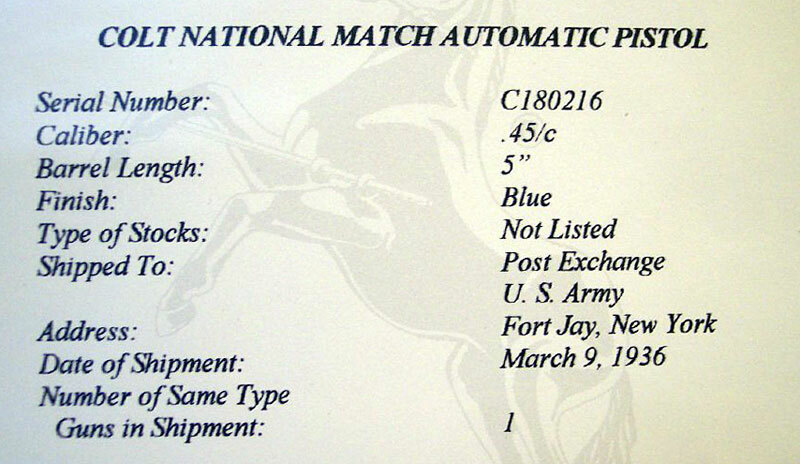 Colt National Match close-up of right side showing "NATIONAL MATCH" roll markings ahead of the standard Government Model slide markings. Frame is marked "GOVERNMENT MODEL" above the serial number. Colt National Match left side slide markings are standard marks found on Colt Government Model pistols from this time period. 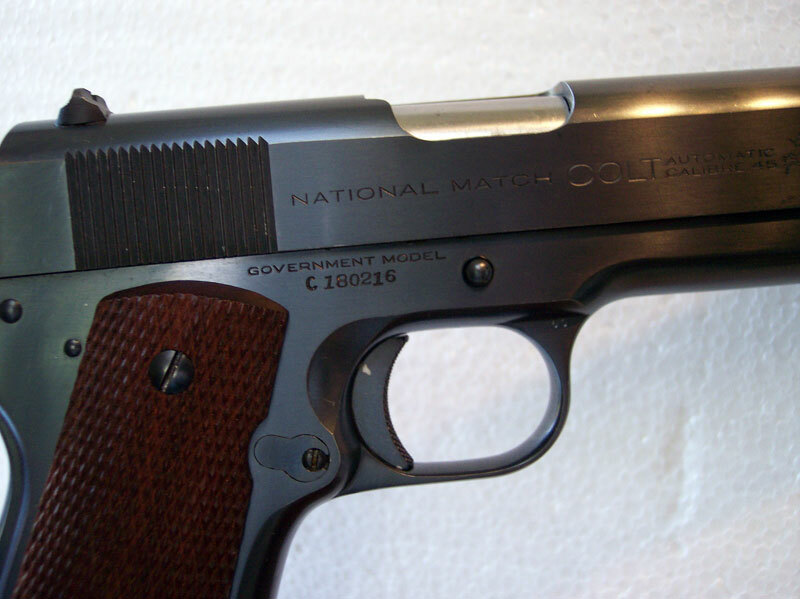 Colt National Match Automatic Pistol - Serial number C180216 was a one gun shipment to the Post Exchange, U.S. Army, Fort Jay, New York, March 9, 1936. 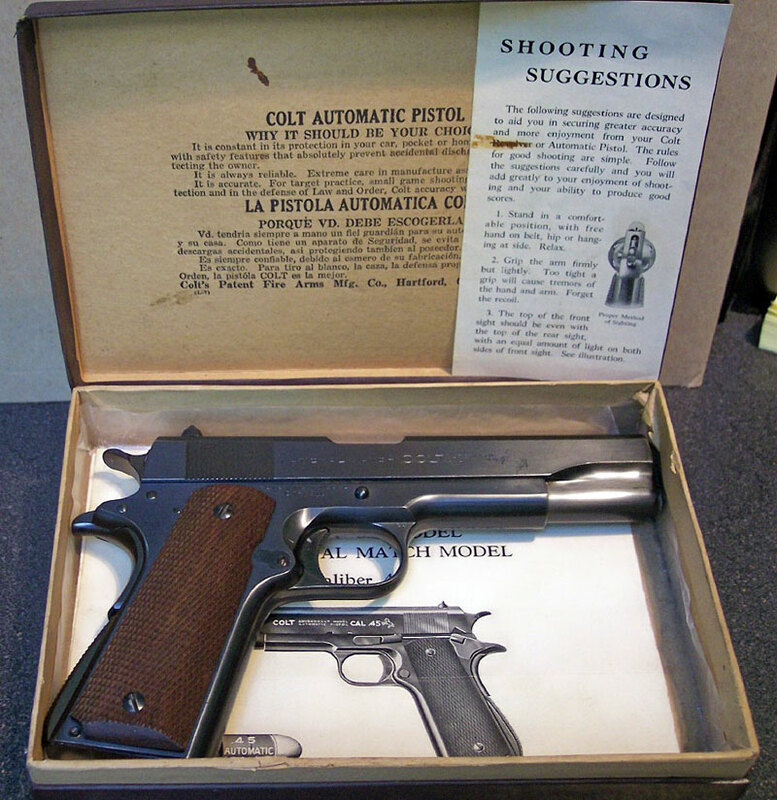 Colt National Match serial number C180216 in original box with factory instruction sheet and Shooting Suggestions. 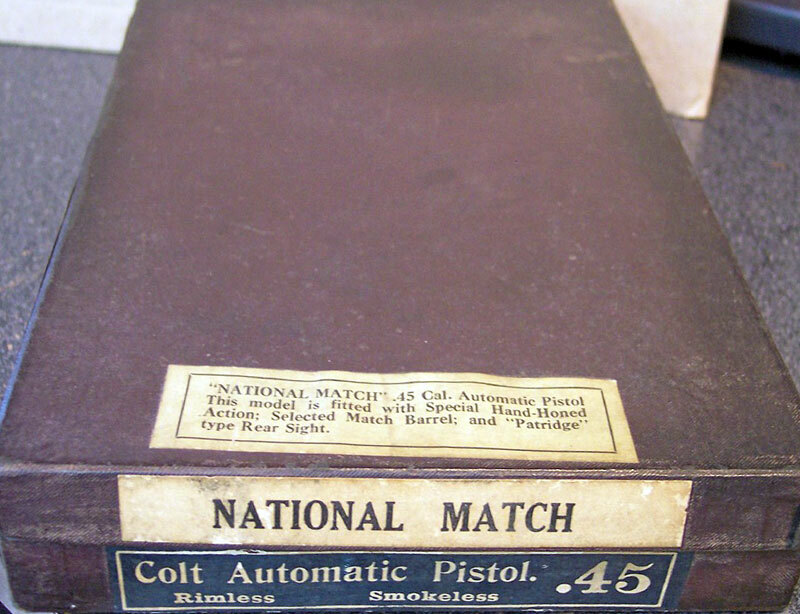 Colt National Match box showing end labels and small label on top denoting the special features of the National Match pistol. "NATIONAL MATCH" .45 Cal. Automatic Pistol. This model is fitted with Special Hand-Honed Action; Selected Match Barrel; and "Patridge" type Rear Sight. Original National Match Instruction sheet from 1936 contains the Colt logo acknowledging the 100th anniversary of the Colt Firearms Company. "NATIONAL MATCH" .45 Cal. Automatic Pistol. This model is fitted with Special Hand-Honed Action; Selected Match Barrel; and "Patridge" type Rear Sight. 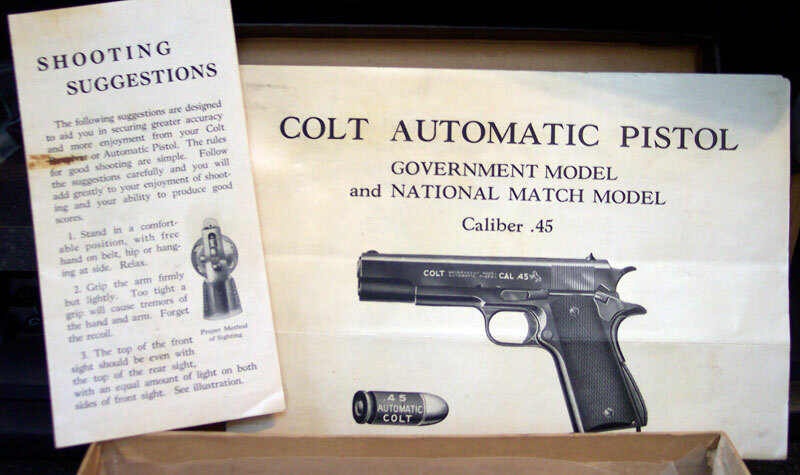 "NATIONAL MATCH" black and white end label on upper part of the box lid over "Colt Automatic Pistol .45, Rimless, Smokeless" blue and white end label on lower part of box. 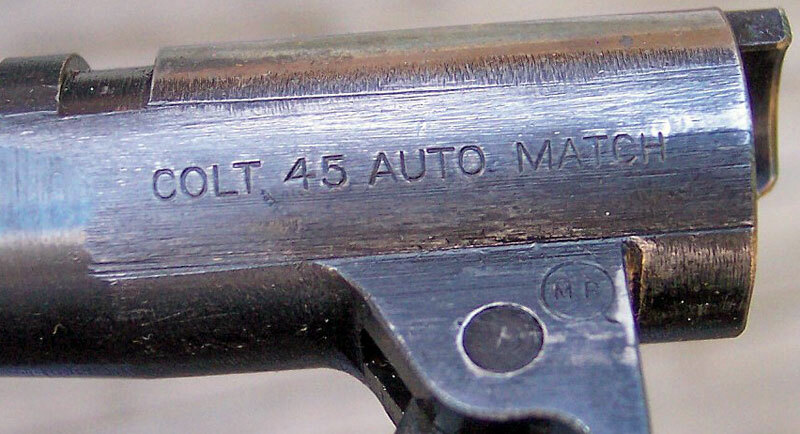 Original Colt National Match barrel showing "COLT 45 AUTO MATCH" over "MB" in a circle, present on the let side of the barrel lug. 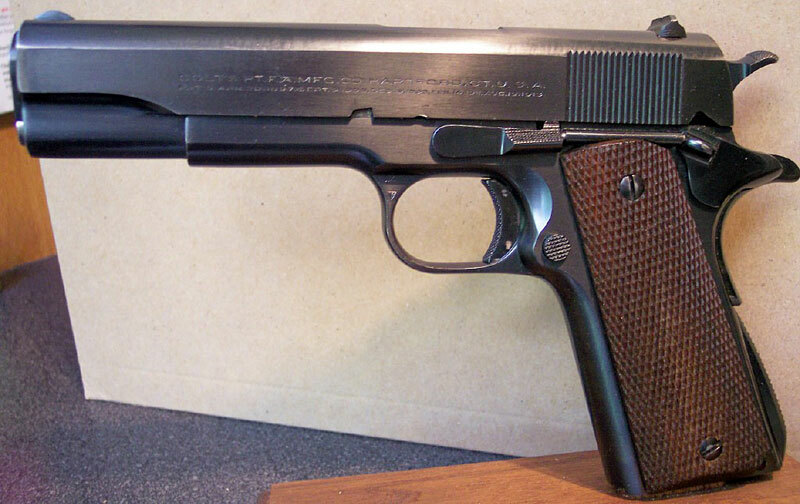 Colt National Match grip safety removed to show assembler's number. Colt National Match rear view of Patridge Sight. Colt National Match rear of slide showing serial number stamped 180216 which matches the serial number on the frame. 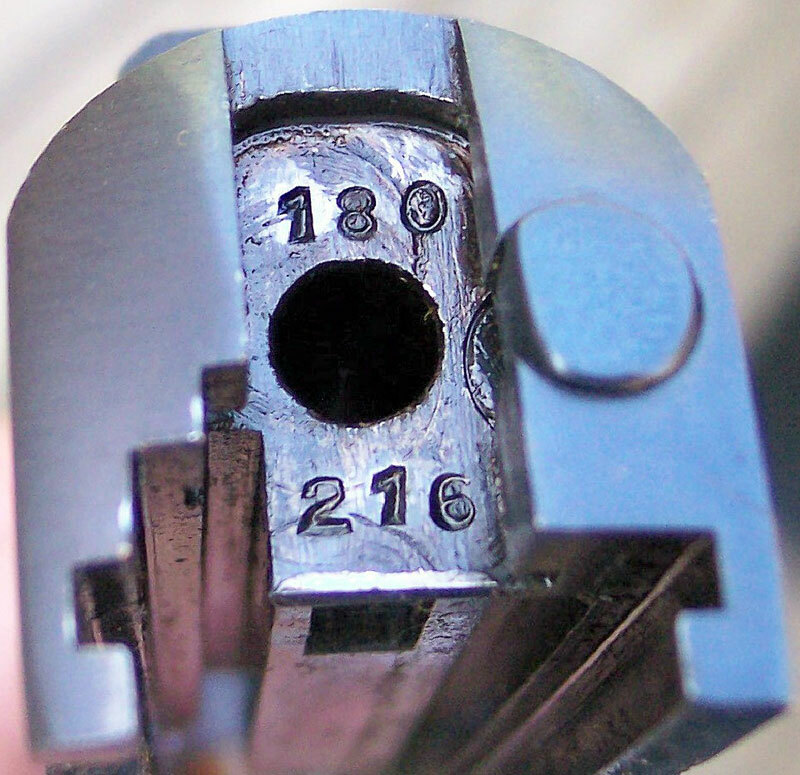 The firing pin stop must be removed to observe the serial number. 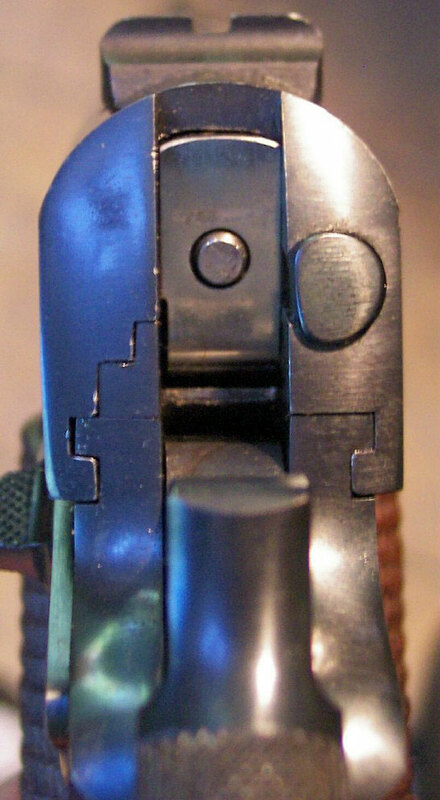 Colt National Match top of frame showing close-up of disconnector. Colt National Match finish on front grip strap. 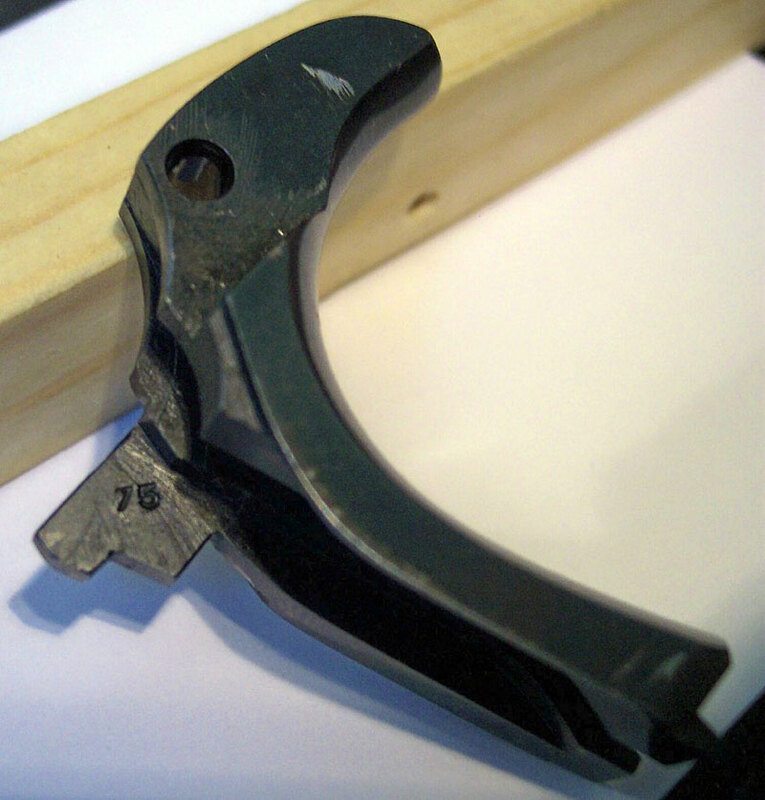 Colt National Match finish on arched checkered mainspring housing, and grip safety. Original two-tone commercial magazine marked "COLT 45 AUTO". 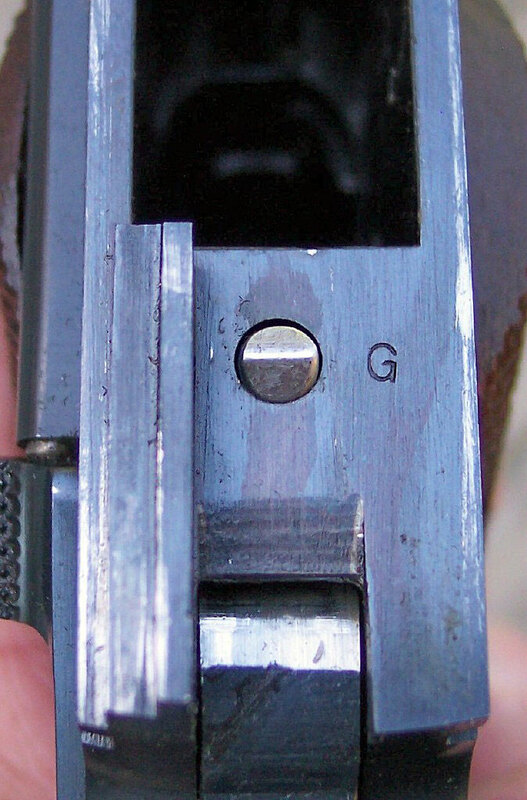 Profile photos of two-tone magazine showing the temper line from when the top portion of the magazine was hardened.